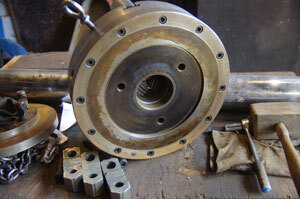 The Cushman 15 inch chuck is quite similar to the 18 inch chuck showed on the next page. 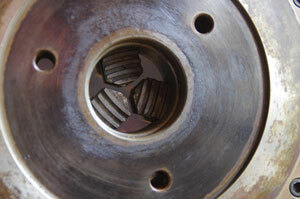 The backside of the chuck is the same, and an adapter that will work for one will work for the other. The center hole is slightly smaller however. Likewise the jaws are different. 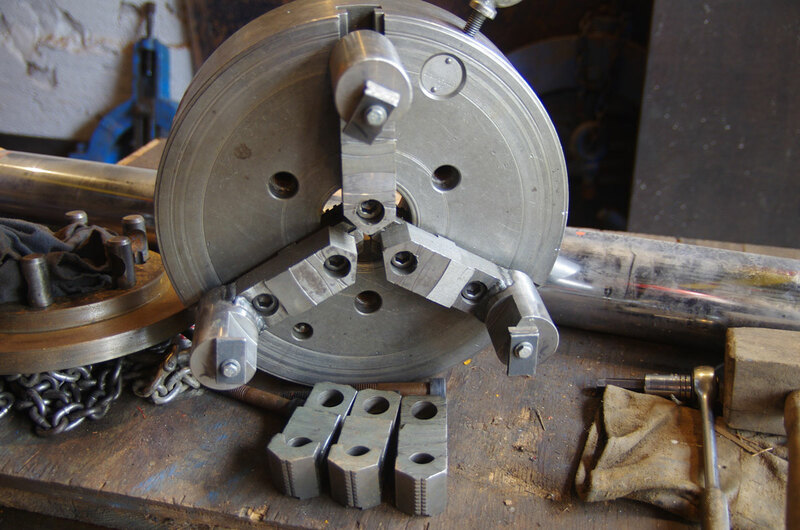 While they are physically the same size the bolt spacing is different, but to the fact that on the 15 inch chuck there is only 1 place to bolt the jaws down, but the 18" chuck presents two bolt positions. As you can see from the 3rd photo, the jaws are badly off the scroll plate when the jaws are fully closed, and it is NOT recommended that the chuck be used for clamping items less than 1.5" in diameter with either this chuck or the 18" model. For this reason when one has a larger lathe that calls for a chuck of this size, it must be understood that 1 chuck is not suitable for all tasks, and a smaller chuck should be be used for smaller items. Generally a 6" chuck or smaller will clamp to full strength down to a 'zero size', and I have a 12" Cushman whose minimum size recommendation is 3/4" inch. My point here is that a 15" chuck is the smallest of the 'large chucks' which are suitable ONLY for large work. While there isn't a major problem using a large lathe for small work, it is important if you are going to do so to have a small chuck available for the task. 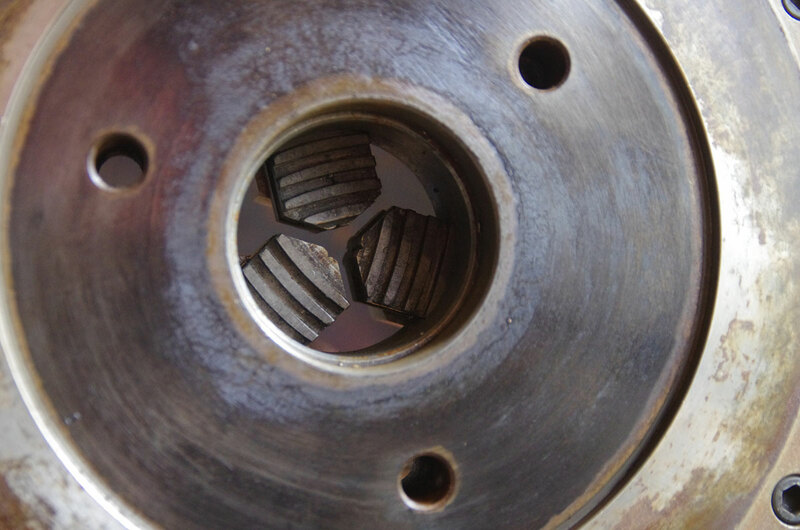 Not only will some chucks not physically close their jaws for small items, The jaws get off their drives when they extend extensively into the 'center hole' and this can cause problems. What happens to a scroll plate chuck when it is over tightened with just a few 'threads' holding on the scroll is that those threads get distorted, and then the chuck has a 'tight spot in in when you try to adjust it in the normal range. Another thing to be remembered about using larger chucks is that they all have maximum RPM ratings. If you have an old lathe, they usually won't go fast enough to get you in trouble. For example the 15" Cushman is limited to 2000 RPM which is probably not an issue for most people, but the 18" chuck is limited at 1300 RPM.